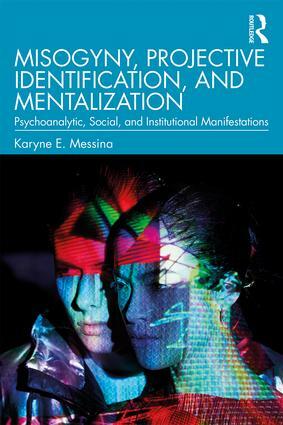 Misogyny, Projective Identification, and Mentalization looks at how the psychoanalytic concepts of projective identification and mentalization may explain the construction of society and how they have enabled misogyny to be expressed in social, political, and institutional settings. Karyne E. Messina explores how misogyny has affected the perception and treatment of women through analysis of a range of examples of individual women and groups. The first part explores projective identification as a mechanism for the suppression of women, looking at the origins of the concept in psychoanalysis and its expansion. The author examines the story of Clara Thompson as an example, arguing that her virtual disappearance from the history of psychiatry and psychoanalysis itself is a telling example of this process at work. The second part of the book uses four examples of individuals, including the recent election loss by Hillary Clinton in 2016, to show that projective identification can (particularly in political and cultural settings) overtake and motivate groups as well as individuals, and lead to violence, atrocity, humiliation, and dismissal of and against women. Part three then features case studies of four groups of women from the 20th century, including victims of the 1994 Rwandan genocide, showing how projective identification against groups has occurred. With specific reference to the erasure of women’s contributions in society, both individually and collectively, and the trauma that arises from the many effects of regarding women as a group as "less" or "other", this is a book which sets a new agenda for understanding how misogyny is expressed socially. Misogyny, Projective Identification, and Mentalization will be of interest to psychoanalysts and psychoanalytic psychotherapists as well as scholars of politics, gender, and cultural studies. Karyne E. Messina, Ed.D., FABP, is a psychologist and supervising analyst at the Washington Baltimore Center for Psychoanalysis and is on the medical staff of Johns Hopkins Medicine in Bethesda, Maryland, USA. She maintains a full-time private practice in Chevy Chase, Maryland. She was previously the Director of the Meyer Treatment Center at the Washington School of Psychiatry and the Director of Continuing Education for Women at George Washington University.